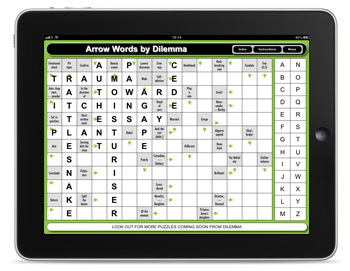 Arrow Word puzzles are amongst the most popular type of puzzle around the world today. Sometimes called Tipwords, Picture pointers or Arrows, the self-containment of clues within the grid and clear arrow directions, makes them extremely popular with readers from the age of 8 to 108! With interlocking grids and succinct clues there is nothing further for the reader to do other than sit back, solve and enjoy! The app is FREE and comes with twelve puzzles.